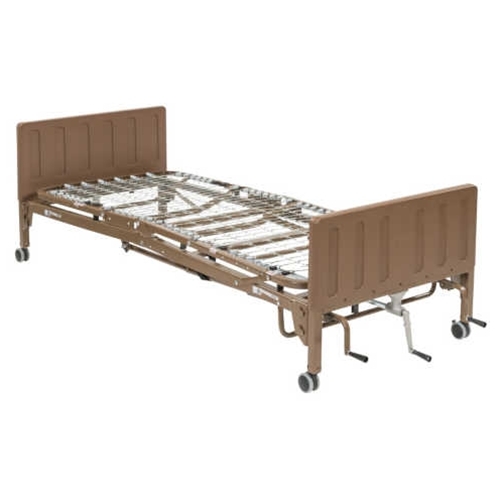 Drive Medical Manual Hospital Bed from HealthyKin.com features adjustable height at the foot, the head, and overall. This multi-height manual bed fits your individual needs, allowing for an anatomically correct sleep surface. Hand cranks at the foot of the bed are used for adjustments and can be folded out of the way, concealing them to prevent injury. The bed comes complete with two full side rails for an added safety measure. Side clips under the angle iron store shaft when the bed is unassembled. The bed ships in two cartons and assembly is easy. The channel frame construction provides superior strength and reduced weight, and a reinforced frame with zinc-coated spring deck resists twisting and bending. Attractive heavy-duty bed ends will mesh seamlessly into any décor and are easy to clean and maintain. Both head and foot ends are interchangeable with Invacare® and Sunrise®. The product is CSA approved and manufactured in an ISO9001 facility. The original purchaser is protected by a lifetime warranty on welds, 5 years on frame, and 1 year on all other parts and components.